Below is a list of memes I am joining for this week, and to save time I am doing one post for all. They are all fun memes to participate in...I hope you can join in with the fun and check out some of the participating posts. Special thanks to all the wonderful host and their memes, I hope you have some time to check them out. I am sharing our most recent trip March 22-24. A two night, three day road trip to Virginia Beach, Virginia. Side excursions were stops at the Great Dismal Swamp NWR, Back Bay NWR, Chincoteague Island National Seashore. 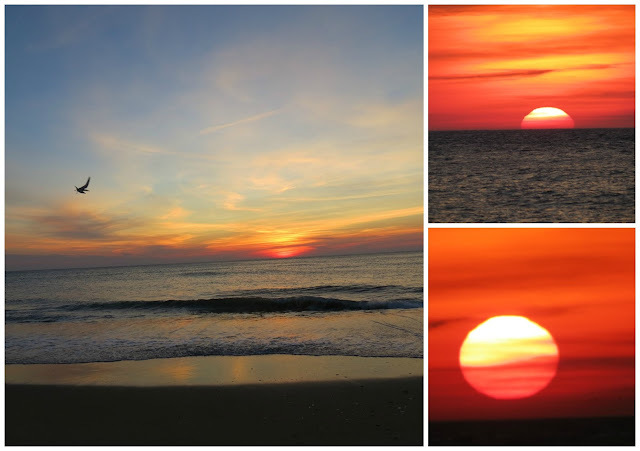 We saw some beautiful sunrises, sunsets and the moon rising over the Atlantic Ocean. Lots of birds, turtles and even some butterflies. 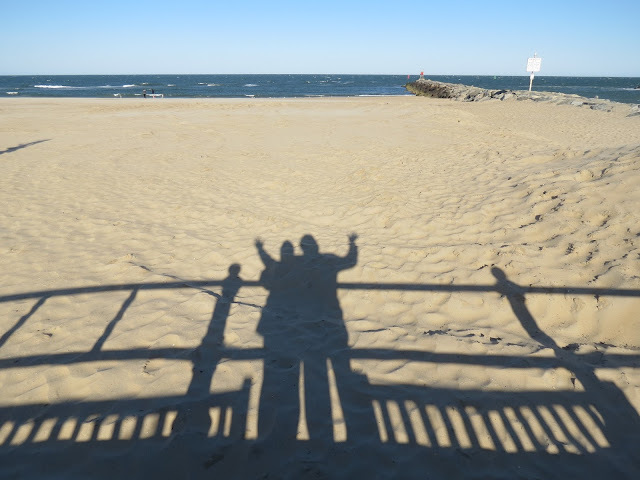 My first time visiting Virginia Beach,Virginia, sharing our shadows. Above the boardwalk, turtle sculptures, gulls on the beach and the surfer sculpture. I am always having fun taking our shadow shots. I think we missed the Spring Breakers, it was not crowded at all. Just the way we like to spend time at the beach. 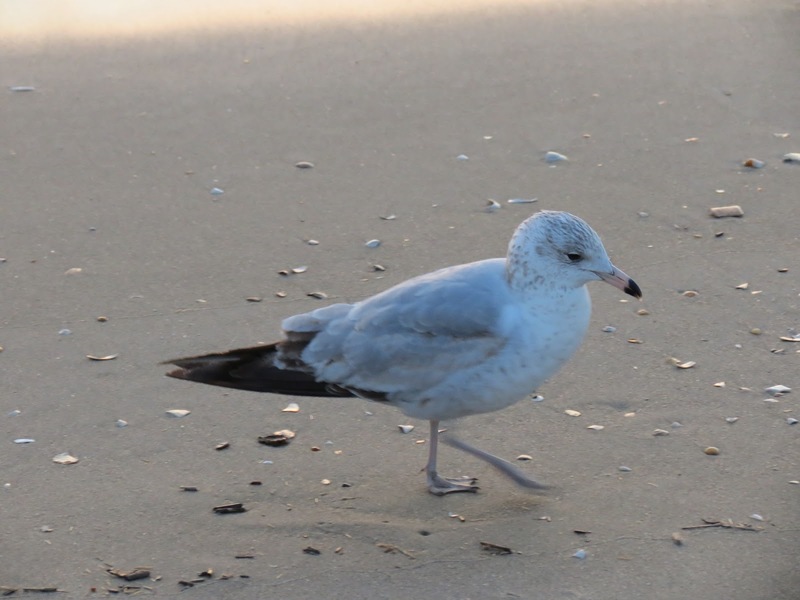 A Ring-billed gull on the beach. 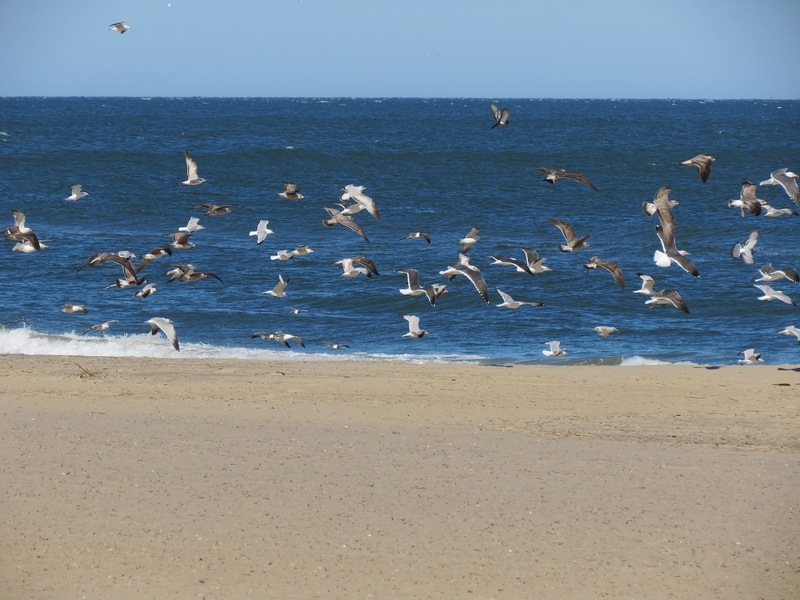 Not many people but plenty of gulls on the beach..I love the beachy colors of the sand, ocean and the sky. The hotel pool was closed for the winter season, but the Mallard ducks claimed the pool for themselves. Our first sunrise at Virginia Beach! Sharing a map of our road trip to Virginia Beach, Great Dismal Swamp NWR, Back Bay NWR and Chincoteague Island National Seashore. It was a great trip, it is always great to visit new places. As always, I appreciate the visits and your nice comments. Have a happy new week ahead! Love those sunrise pics, Eileen! Beautiful photos, Eileen - what a fun trip! Beautiful collection, and nice looking beach with the gulls. Have a nice week, and best wishes! Such amazing colours in all of the photos, beautifully artistic captures. Love the fun one of your waving shadows. Ya know, I'm thinking you're ENJOYING retirement, Eileen! I enjoyed your photos, especially the shadow shots! So happy that the area was not crowded. The duck in the pool is cute! Very beautiful and relaxing series, Eileen! Thank you so much for sharing. That is a wonderful places, to take shadows, Ring-billed Gull and the beautiful skies. I've been to VA Beach once and it was amazing...love that opening shot! That's how I like the beach -no people and plenty of birds:):) Am surprised there is no snow! Have a great time there and many thanks for your great shadow shot for SEASONS! A happy week ahead, and "see" you back soon! Shadows in the sand, a empty beach is good for the soul. A duck in the pool now thats different. Beautiful photos. I haven't been to Virginia Beach. Looks like a great place to visit. Wow, gorgeous sunrise! Love all your captures, Eileen! Love your photos! The beach in any season is wonderful -- I especially love it when there aren't many people around! Those sunset shots are amazing! I also prefer a quiet beach! Looks like a lovely place to visit! I love the shadow shot, Eileen, and I'm so glad you included a map of your route. I love maps. They make all the difference! Thank you! Wonderful sunrise pics! And cute shadow photo too. I like y'alls happy shadow. Love the shadow shot as well as that gorgeous sunrise. Lovely spot. My computer has decided to behave again however I managed to deleete all my emails from my IPad!!! Have a great week ahead. Nice to see the ducks taking back some habitat! wonderful beach photos Eileen but I really loved the shot of the mallard claiming the hotel pool for itself! The water was a lovely colour! Your sunrise shots are beautiful. Love the way the mallard claimed the hotel pool. What fun as you share your shadows. That is a gorgeous sunrise photo near the end! Have a good week! I loved the shadows shots, as well! The first one... is perfect!!!!! And I loved all the rest... but those with the sunset... are just stunning!!!!! 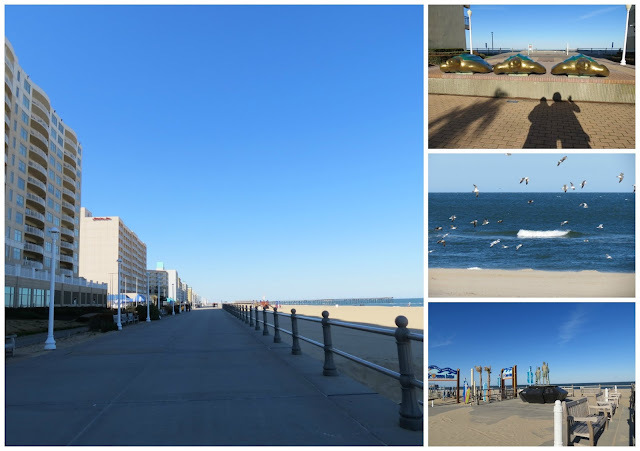 What a wonderful beach and great photos, Eileen! "Not many people" sounds lovely, and the photo of the gulls on the beach is indeed very beautiful. Such wonderful colours! Thank you for sharing. Have a lovely new week! Great shadow pics and I loved the sunrise pictures. Nice that you mussed the spring break crowd! Looks like a nice road trip . . .
Oh my, but your photos take my breath away. Your sunset is just amazing and I'm speechless!! Thank you and have a wonderful day! I love that you include a map! I usually look places up when someone mentions them. What a beautiful beach and a fun time you had. I love having lots of photos from our trips....brings back the happy memories! Hugs! I would love to do that trip! That is one place on the east coast I would love to visit. Great photos. Love your birdies as always, Eileen! Very beautiful shots from the beach. The sunrise is cool. wow that sunrise is just amazing Eileen. Oh my, such beauty, Eileen! This looks very much like Carolina Beach where we were last weekend. I love seeing more birds than people... that's for sure...and the sunrises are glorious! Beautiful sunrise...What is a pool without a Mallard?? Love the shadow shot, and your birds, of course. 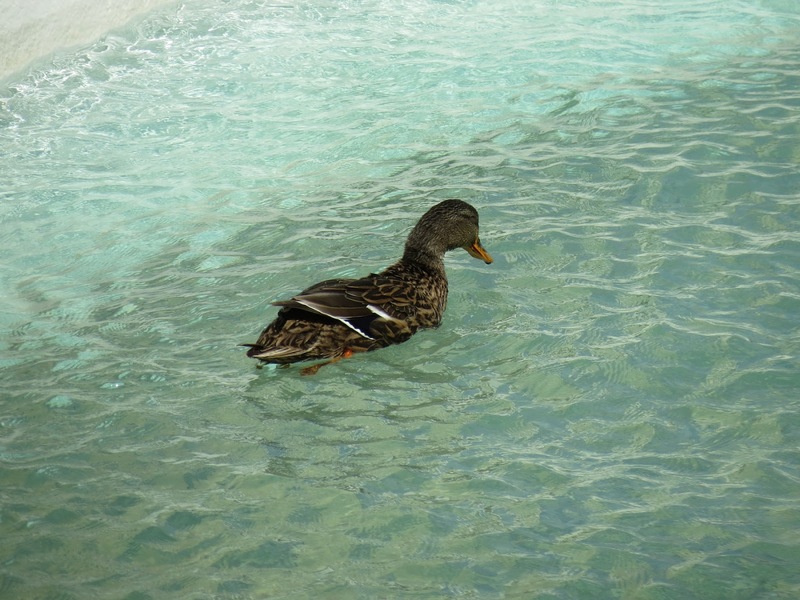 Love how this duck is enjoying his time in the pool:) So cute! i always enjoy the shadow shots, this one is especially fun!! and those ducks, always hogging the pool, we had 12 once in ours, they are so hard to get rid of!! i think you could have shared this with fences as well!!! Fabulous shadow image.....all beautiful....love the sunsets! All images are beautiful. Love the sunrise over the water and the shadow image is fun. Oh darn! If I had known... we could have met! I live in VAB! Love the shadow pics you got--very cool! I haven't even been to Dismal Swamp yet! But I hear there are lots of warblers there now! End of the week, when the weather settles down... I'm going! Thanks for sharing! Nice trip, lovely pictures ! That duck is so funny and clever too. Very nice ! I really love the sunrise ! enjoyed your photos. That first shot is very cute! I particularly like that photo of the gulls in flight. It looks to be such a sunny day and it must be nice for the birds to have the beach to themselves. A stunning sunrise Eileen. One place we stayed at in Florida an egret claimed the (in use) pool as its own. Darn thing would squawk at the pool cleaner every morning until he could convince it to leave - good morning coffee entertainment. Hi Eileen, Mallards in the pool! Ha! That is one of the many reasons why here in FL most have bird cage enclosures around the pool for homes and smaller hotel pools. Have a great day tomorrow! Excellent pics by the way! I loved your photos of your trip! Looks like a fun time with some lovely scenery. Virginia has a wonderful and diverse seashore--you visited s good places. The sunrise was beautiful and I'm sure you enjoyed beachcombing along the quiet shore. The boardwalk looked quiet--the best time to take a stroll! That was a beautiful collection! such a wonderful place with sunshine, beach, birds and a fantastic sunset. Amazing ! mmmm.... beach.... sun... nice photos. what a wonderful sunset. I appreciate that you included google map. Such a beautiful sunrise! I enjoy to see your shadows on the beach. I say hello to you too! Happy spring for you! It looks like you had a good time. The sunrise is so, so beautiful. Beautiful photo adventures you always seem to have ~ Wonderful and beautiful! That looks a fantastic road trip Eileen and beautifully photographed. The photographic journal is a great way to keep the memories of a holiday. Great shadow shots and lovely seagulls and ducks too. You chose a good time for a break Eileen. No people, just birds and wide open spaces - just wonderful. Do enjoy the rest of your week and lets hope it warms up at home soon. Lovely photos, specially the mallard in the pool! I love the shadow pictures, they sort of show that you were part of everything without disturbing it. A great looking Ring billed Gull Eileen. I love road trips too! To be honest, I do not know a lot about the area you visited. However, I would like to learn more about the places you stopped by. You're certainly making the most of being retired, Eileen. It is enjoyable to go to places that have few people disturbing the birds! Hi Eileen, the sky is so very very clear! If that happens here now nobody will be able to walk the streets, as even if we still have clouds our temperatures is >36°C with Heat Index of 40°C. STay outdoors for a few minutes and you will dry up. That was a long route you took but definitely an enjoyable one! Lovely captures all. Loved the mallard duck in pool pic the best! lindas imagens de pássaros , sol, e sombras! Beautiful photos! I love the mid-Atlantic area. I used to work in D.C. (while still living in California) and had a lot of time to explore. Both your route and map made me a bit nostalgic. So many layers of history out there. I love these sunny blue images. I love those photos of the sunrise! Boa tarde, belos registos da maravilhosa zona marítima, a praia é fabulosa. The sunrises photos are beautiful. Loved your shots from the beach. It has been years since I've been to the ocean, but I still vaguely remember the seagulls looking for handouts. Building sandcastles (only to have the tide come in and destroy them--and building them again the next day) and finding sea shells were what made the biggest impression on me though! Hello Eileen! Lots of beautiful aspects captured at the shore and it must be a gorgeous trip! For sure, these critters are so lovely! The sunrise in collage is so fabulous! Many thanks for sharing these beauties with us and warm greetings to you! It must be wonderful to be able to go on trips, it seems we are always tied down to our gardening, cat, and other projects, though we stopped keeping poultry last year so are closer to being able to travel at will. The beach and blue sky are so beautiful and restful, and so many gulls! I chuckled at the duck in the swimming pool. Nice shadow shots too, Eileen. That looks like a nice time. Beautiful sun and some beach....and cool breezes? I wouldn't mind a bit:) Have a great week! Looks like a great trip! I appreciate the map. Hi Eileen, These are sure some neat pictures. Makes me want to visit the beach! :-) Especially love those sunrise photos! Very nice post. Hope you are having a fine week. Fantastic views, Eileen, great sunrise images. Your first visit to visit to Virginia Beach was also very nice. Very nice photos and a beautiful sky by the sun. I love your sunsets and of course your birds. Photos of very familiar things to me!!! My hubby lived in Chesapeake when my Dad was stationed in (and we lived in) Norfolk. Years later we lived again in Chesapeake, and also in Portsmouth and Suffolk. Our daughter lived in Norfolk. Been to Va. Beach many times! And the Great Dismal is one of my favorite places on earth! Your photos sure brought back memories...can't wait to see more! I love your shadow shots, Eileen - what fun! Beautiful photos all - stunning sunrise! Beautiful trip and great photos.